As soon as I stepped into an Orthodox service in Tokmak this morning I felt swept up into an ocean of Ukrainian /Russian history. The high ceilings, the quavering, pleading, singing voices of babushkas, and the icons looking down on you take you into the past and don’t require translation. I found myself mumbling in English when all around others were saying the Thrice Holy Prayers, responding to the Litany with “Lord have mercy,” or joining in the Alleluia. I also noted that you do not just stay put in an Orthodox service, there is an amazing amount of movement including quiet shuffling to an icon, lining up for communion, and taking part in many different forms of bowing. I am not a frequent attendee of Orthodox services. 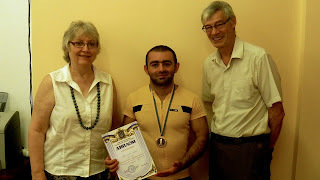 I feel much more a part of a community in the Kutuzovka Mennonite Church. Here, every Sunday I am accosted by bent-over women, whose walk is an ad for orthopedic surgery. They keep asking, “When is Linda coming?” This is a community that has a caring attitude, almost “in your face” Even here, I am trying to get by with little translation service, focusing on the Spirit and not the words. The services have a distinctly different approach to dealing with children. In the Orthodox service children are expected to be quiet, not have any toys, and be under parental supervision at all times. They have their own separate communion service where they come up, open their mouth, and the Priest inserts the spoon. Most were amazingly compliant. In the Kutuzovka Mennonite service children worked on puzzles, drew pictures, had snacks, and showed me their hot cars. While the men were serving communion one cute young girl went up front, stood by the communion table, faced the audience, and munched on a fine looking apple. Ironically, the preacher spoke on Genesis 1; perhaps the little girl was role-playing the scene of Eve eating the forbidden fruit? I enjoyed both services and did not find the children in either service disruptive. Today I was informed that one of the women in the Kutuzovka Church had passed away two weeks ago. She had been in the hospital but was sent home to die with her family. She was given pain medication and died at 6:30 the next morning. The family immediately contacted people, brought in a Minister, and had the funeral by 3:30 that afternoon. Apparently there are no morgue facilities in the area, and with the heat we are experiencing they have to make quick burial arrangements. This experience is another reminder that it is indeed a different world here. 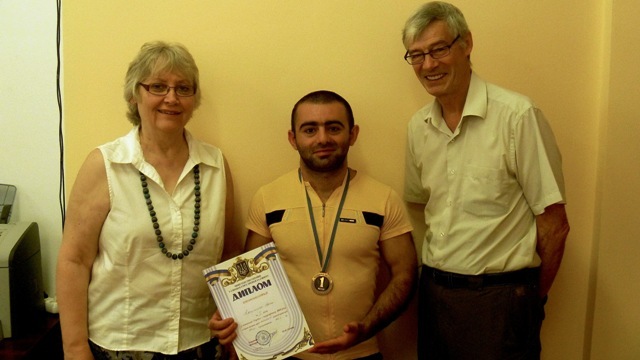 Last summer we supported Aram Arzumyan from Svyetlodolinskoye (Lichtenau) so he could travel to the European power lifting championships in Czech. 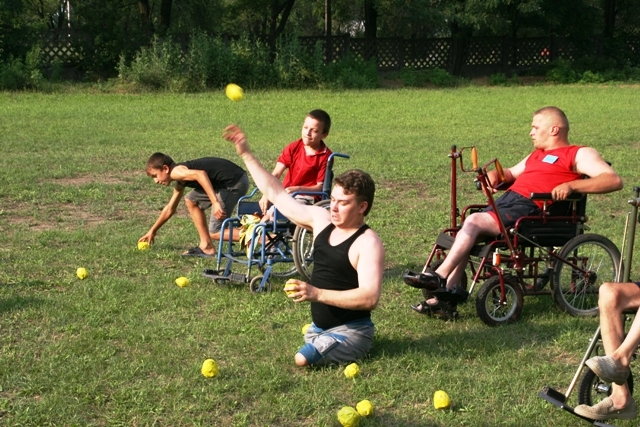 This summer we funded a camp for physically disabled young adults in Zaporozhye. The Olympics remind me that it is healthy for youth to pursue their dreams, be that on the national stage or at the community and regional level.